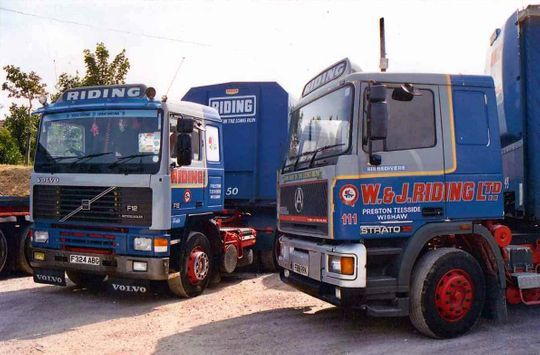 Over the years it became apparent that at times the in house fleet of W & J Riding could not always cope with large increases in the workload which can often occur in the haulage business. To alleviate this problem the company took on a number of sub-contractors who themselves operated a variety of different vehicles which otherwise would not have been seen in the familiar W & J Riding livery. 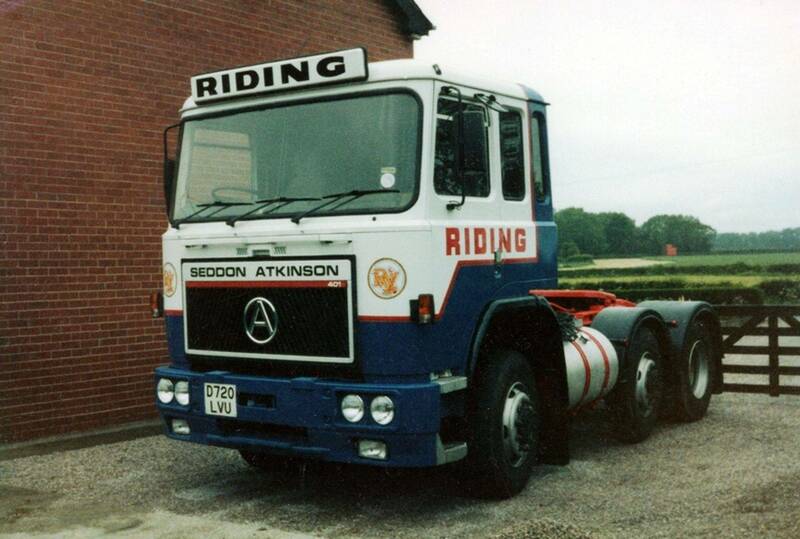 Seddon Atkinson 400 Series 4x2 tractor unit Reg No NVT 456W was registered new on the 1st of September 1980 and operated by Norman Billington of Garstang on contract to W & J Riding. 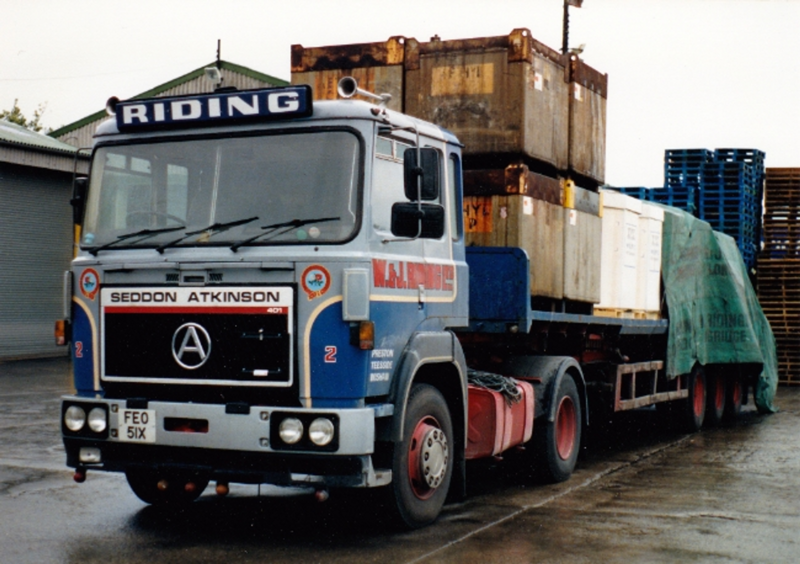 Seen here in the yard at Riding's Thornaby depot on Teesside it is coupled to one of Riding's own 40 foot tandem axle trailers. Powered by a Rolls Royce Eagle engine you will notice it does not bare a fleet number or a name, unlike Riding's in house fleet vehicles. Norman Billington of Garstang also operated this Seddon Atkinson 400 Series 4x2 tractor unit Reg No FEO 51X. Looking all the part like a Riding fleet motor FEO 51X was originally new to Ken Surphlis of Barrow in Furness. Ken later sold his business to Brady's of Barrow who then sold the unit on to A P Lee. After a while A P Lee sold it on to Norman Billington of Garstang who gave it a Riding livery and put it to work on contract to Riding's. Photograph courtesy of the late Jim Taylor archive. Another fine shot of Norman Billington's Seddon Atkinson 400 Series 4x2 tractor unit Reg No FEO 51X. This time it is pictured in the depot at Longridge after collecting a load of mixed freight. Photograph courtesy of Geoff Milne. 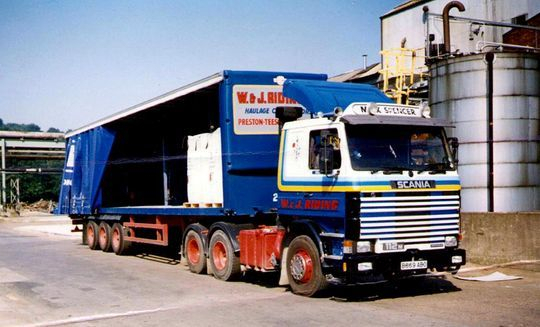 In 1989 driver Mick Spencer, who until then was employed by Riding's, decided to go it alone and bought this Scania 112M 6X2 tractor unit Reg No B869 ABO. "As you can see i put the W & J Riding name on the doors along with my own little touch naming it 'Dalesman'. When Tom Riding saw this go past his window at Longridge for the first time he apparently said "What the bloody hell was that!" I took the photograph above while loading up at the ICI plant at Wilton Teesside with one ton bags of adipic acid for delivery to the ICI plant at Huddersfield. This kind of load was a regular bread and butter run for me". Originally this Scania 6X2 tractor unit Reg No B96 WCK was bought new by Preston's of Chipping on the 1st of March 1985. 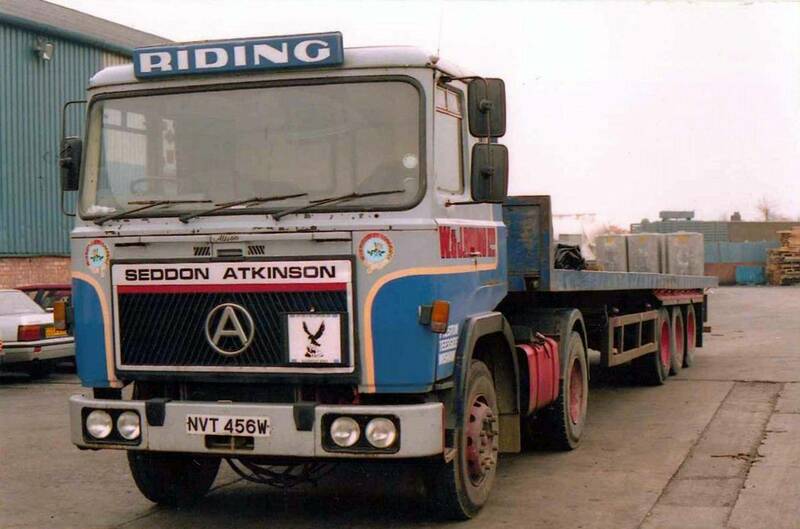 Driven by Brian Preston he sold it after four years in 1989 to Tony Lees who was a sub-contractor at W & J Riding. Tony painted it up in Riding's livery and it was driven by Ian Noblet who today now owns North West Commercials. Ian purchased a set of twin stacks, fitted them, and drove it for about three and a half years keeping it in immaculate condition. Thanks to Lance Biscombe for supplying the information. Three sub-contractors in a row! Seddon Atkinson 400 Series 4x2 tractor unit Reg No FEO 51X, Volvo F10 4X2 tractor unit Reg No A585 JFY and Iveco 4x2 tractor unit Reg No B723 CTU were all owned by Tony Lee. 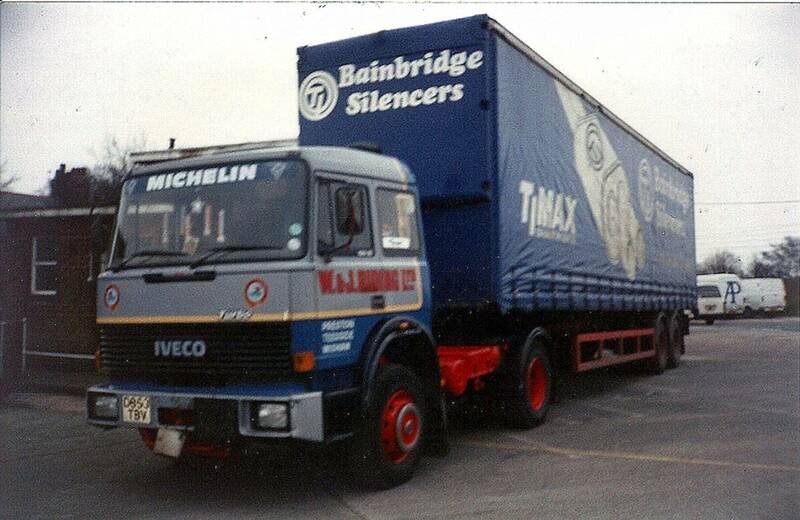 The Iveco on the right was driven by Mick Maudsley, who was married to the sister of Tony Lee at the time. An on the road shot of Iveco 4x2 tractor unit Reg No B723 CTU. 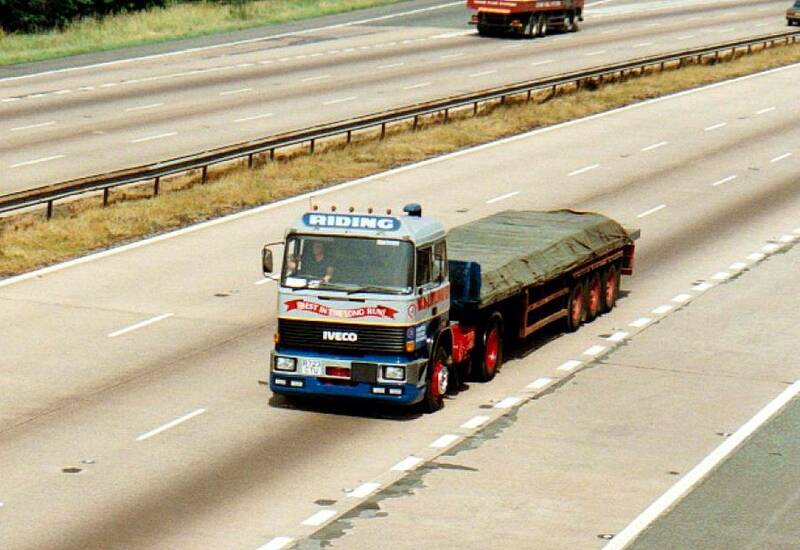 Operated by Tony Lee and looking quite smart in full Riding livery it is pictured here in 1985 heading South down the M6 at Junction 12 loaded with steel plate from the British Steel Corporation plant at Motherwell. Photograph courtesy of Roger Pickering. 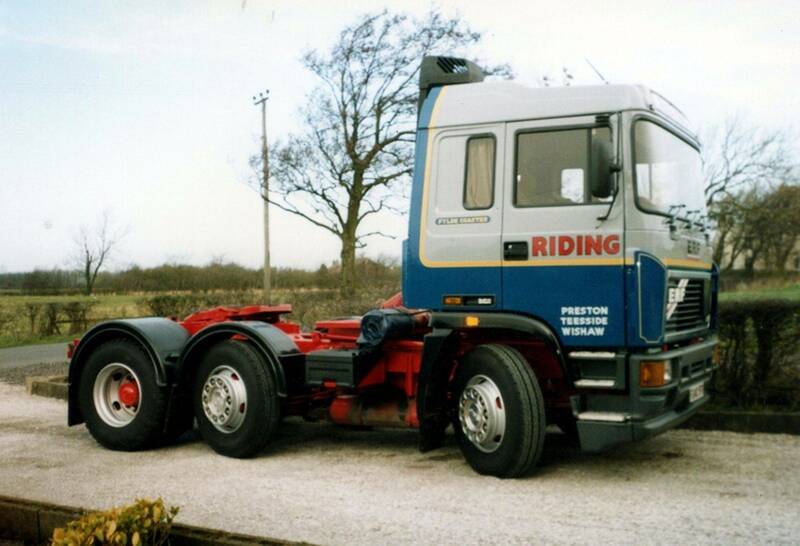 Norman Billington of Garstang owned this Iveco SR 190 30 4X2 tractor unit Reg No D853 TBV which he operated in full W & J Riding livery. Powered by a 13.2 litre six cylinder 300HP Fiat engine in line with a 13 speed Fuller gearbox and Rockwell rear axle it was driven from new by Steve Richardson, remaining on contract to Riding's for six years until 1992. 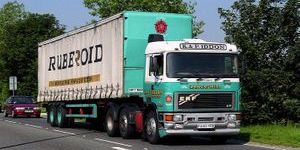 R J & I Wells Ltd of Great Eccleston operated this rather smart looking Seddon Atkinson 401 series 6x2 tractor unit Reg No D720 LVU. 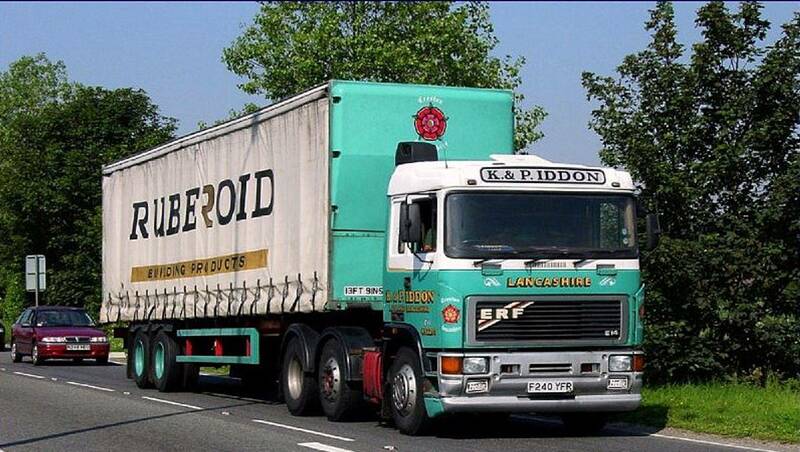 Powered by a Cummins 320 engine this tractor unit was an ex demonstrator from Seddon Atkinson and was only used for two years after which time it was replaced by ERF 'E' Series 6x2 tractor unit Reg No F240 YFR pictured below. Driven by Eric Kershaw he didn't particularly like the vehicle stating that it 'always seemed to lack power'. After only two years on contract with Riding's D720 LVU was sold on to Loud Vale Haulage Ltd of Cockerham Lancaster. 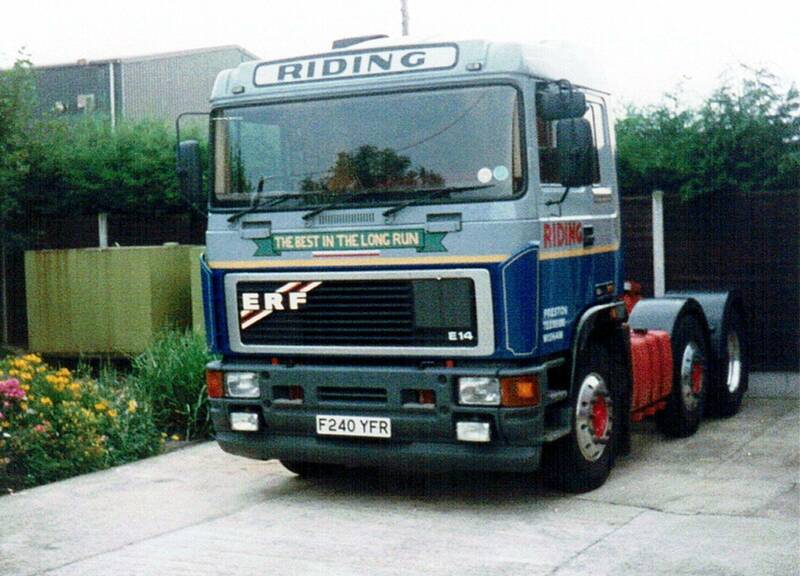 Operated by R J & I Wells Ltd of Great Eccleston ERF E14 6x2 tractor unit Reg No F240 YFR was named 'Flyde Coaster'. Powered by a Cummins 32O engine it was supplied brand new to R J & I Wells Ltd by W & J Riding on the 10th of February 1989, replacing Seddon Atkinson 401 series Reg No D720 LVU. Powered by a Cummins 32O engine it was supplied brand new to R J & I Wells Ltd by W & J Riding on the 10th of February 1989 and completed 800,000 km in the six years it was on contract to Riding's. Photograph courtesy of Eric Kershaw. 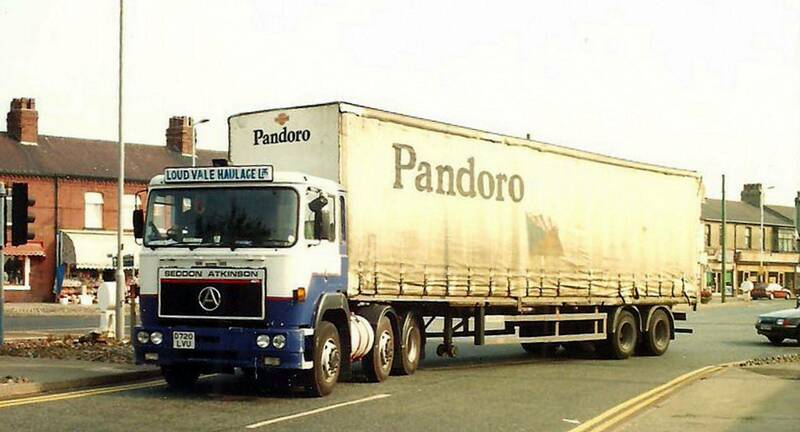 Volvo F12 4x2 tractor unit Reg No F324 ABG was named 'Cannonball'. 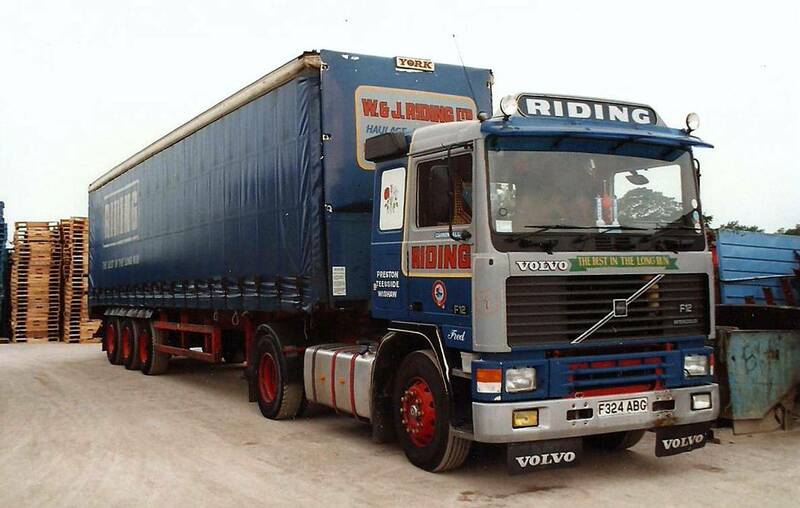 "This Volvo was owned and operated by James L Ball, who happens to be my brother in law, and was painted in our livery when brand new and operated as one of our own fleet. My nephew David Ball, who had previously served his apprenticeship with our company, left to join his father and he was the first man to be allocated this vehicle. 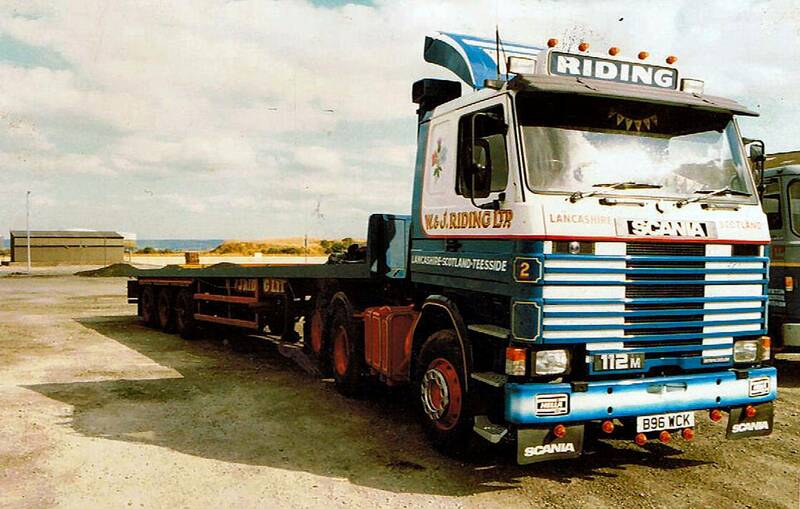 It was operated for 12 years and David said it was the best lorry that he had ever driven. Fred Thomson later drove it for a while but our work dropped off at this time and Jimmy found alternative work for it. 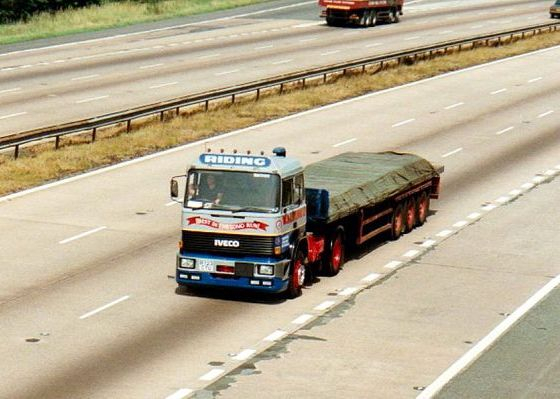 Fred then joined our company as a driver and worked for us until ill health curtailed him." 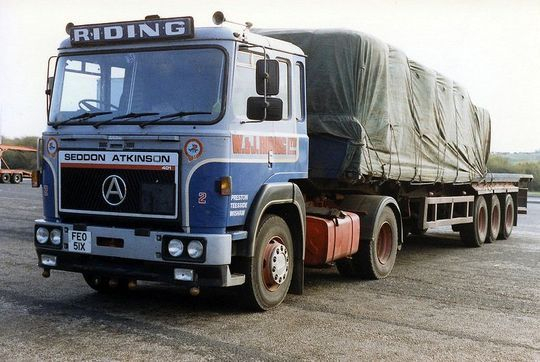 Another shot of James L Balls F12 Volvo Reg No F324 ABG next to company owned Seddon Atkinson Strato Reg F881 RRK Fleet No 111 'St Bedivere'. This picture clearly shows how a basic cab design could be used by four different manufacturers in this case Volvo, DAF, Seddon-Atkinson and the Pegaso Troner.